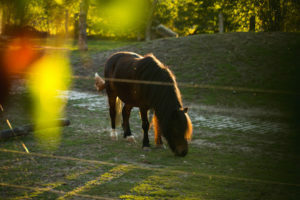 The horses and ponies of the Steigerwald Ranch live in an area of roughly one hectare, interestingly varied in its elements and constantly enhanced to provide new incentives for the horses to move around and explore. But don’t worry, even if your terrain and budget is smaller, you will find many suggestions and helpful ideas in our blog. Our horses’ lives encompass many more hours than only the woefully short amount of time we spend with our animals. 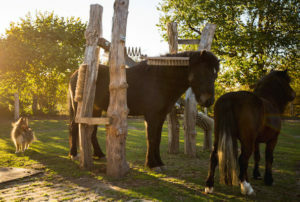 Therefore, we feel it is vitally important that the horses’ surroundings are set-up to provide an appropriate habitat for the animals to meet their species’ needs of movement, social interaction, rest, play, etc., in short: offer them high quality life time. The point we are trying to make is: Even if we spend two hours a day with our horses, there still remain 22 hours – that translates to an impressive 92% of the day – for the horses to while away. These figures make it easy to see that no amount of effort put into stimulating, interesting training sessions can possibly compensate for a less-than-optimal environment. The Steigerwald.Trail is roughly 800 m long and runs along the boundaries of the whole ranch area. 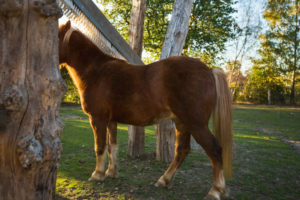 The horses need to walk quite a distance between their water supply, different feeding places, shelters, mineral licking stones and branches to nibble. 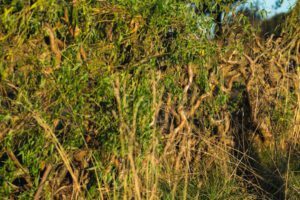 The ground varies from very soft (sand) to medium soft (rubber mats, various types of paddock mats, forest floor with intertwining roots) to very hard (stone, concrete and pebbles). 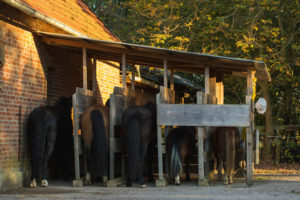 On the Steigerwald.Trail the horses can choose between a small copse for shelter from weather and insects, two airy stables with natural compost floors (as suggested by Tanja Romanazzi) and one stone stable as part of the original farm house. We regularly try out a multitude of materials, purchased and self-designed tools and accessories. 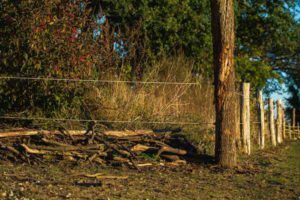 The list contains windscreens, hay toys, mats, toilets, feeding stations, scratching brushes, smart tool trolleys for fence repair, SMS driven electric fences, and much more. We test anything that helps enhance our horses’ lives and simplify our daily routine at the ranch. Go to our blog to read our test results. The definite highlight for all animals and humans is The Playground, where all Steigerwald.Training & Therapy equipment is set up. In addition to the equipment that is for sale, all kinds of prototypes are installed in the playground. There is also a small mound with softer slopes for up- and downhill training as well as one vertical edge for jumping. Not to forget a tunnel, a water ditch, a jumping ring and much, much more. You will find anything a training enthusiastic might wish for. Want to know more? Go to Steigerwald.True Horse Agility.